Now that we’ve completed the living spaces in our homes, we’re organizing the laundry room for Day 22 in this 30-day home-organizing plan. If you’re just discovering this program, check out the series overview for the introduction and links to previous days’ missions. So, today, let’s ROCK by organizing the laundry room! Removing clutter, as we’ve repeatedly discussed, starts by focusing on the function of a room or space then subtracting everything that doesn’t serve the function. Laundry rooms are a bit trickier, though. 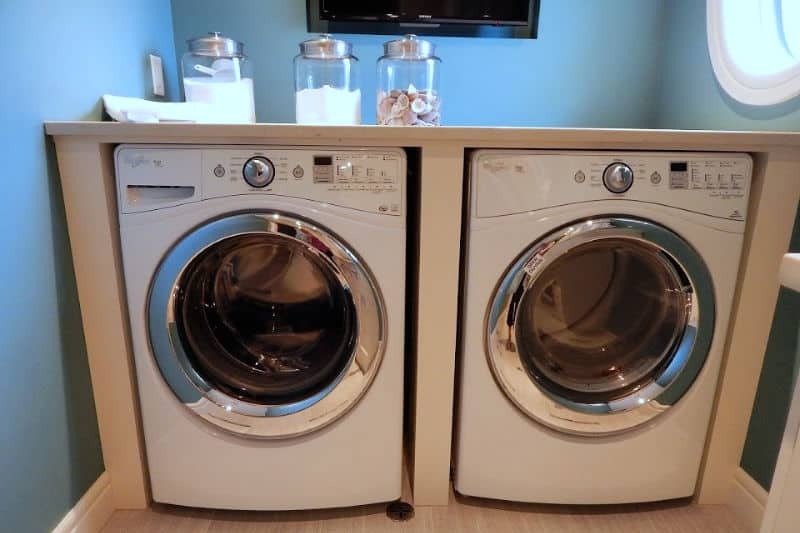 The name implies they are only for washing and drying clothes, yet a well-organized laundry room will hold everything else you need to keep clothing in good shape. Wastebasket for lint, trash, etc. Organizing the laundry room makes it easier to use and a little less miserable to do this seemingly never-ending chore. Ideally, you shouldn’t need to move anything or shift things around just to do a load of laundry. A few tweaks to your existing laundry room can help. Hanging prevents wrinkles. If you aren’t a fan of ironing — I’m not — you can often skip it by taking clothes out of the dryer while they’re still ever so slightly damp, then hanging them to finish drying. A rolling garment rack is fantastic if you’ve got the space for it, especially if you have a one-floor home. 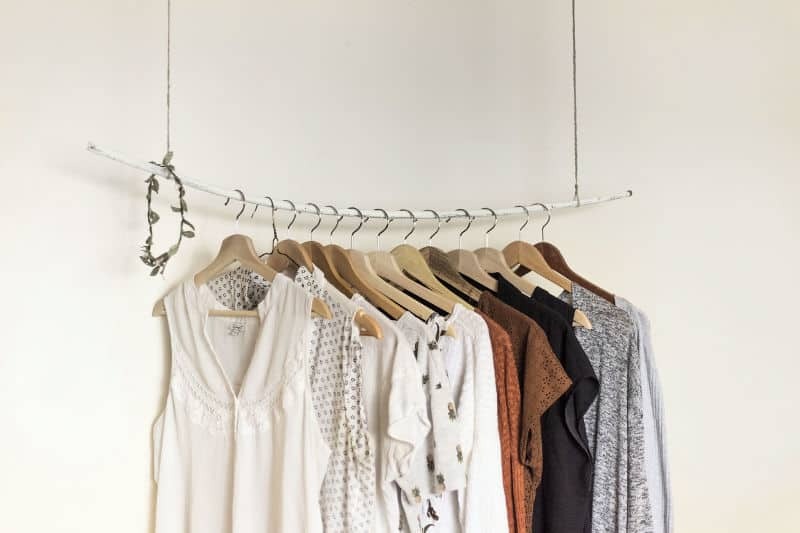 If you’re short on space, consider mounting a closet rod from ceiling hooks, so you’ve at least got somewhere to hang clothes right as they come out of the dryer. 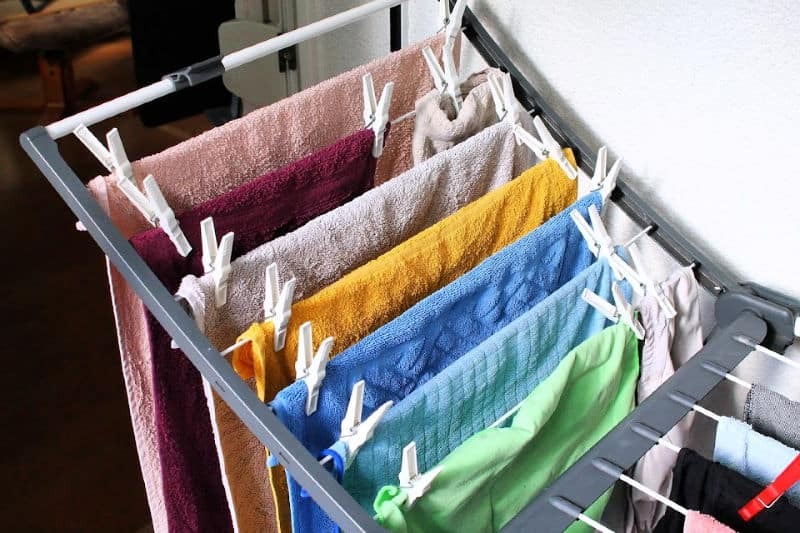 A collapsible drying rack gives you space to flat-dry things like bulky sweaters. Tuck it alongside your appliance or hang it on wall-mounted hooks when not in use. Sorting clothes on the floor leads to overlooking things. 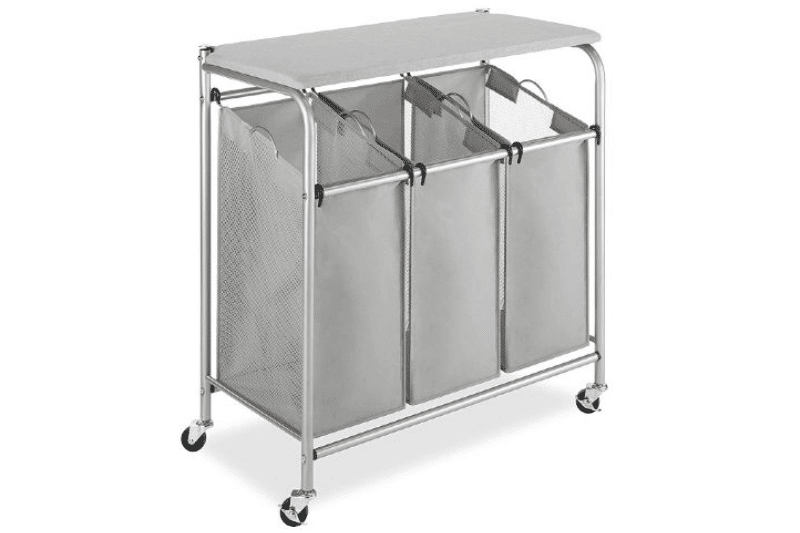 If you’ve got the space, a rolling laundry hamper allows you to sort throughout the week and can provide extra counter-top storage, too. When a compartment is full, you know it’s time to do a load of wash. 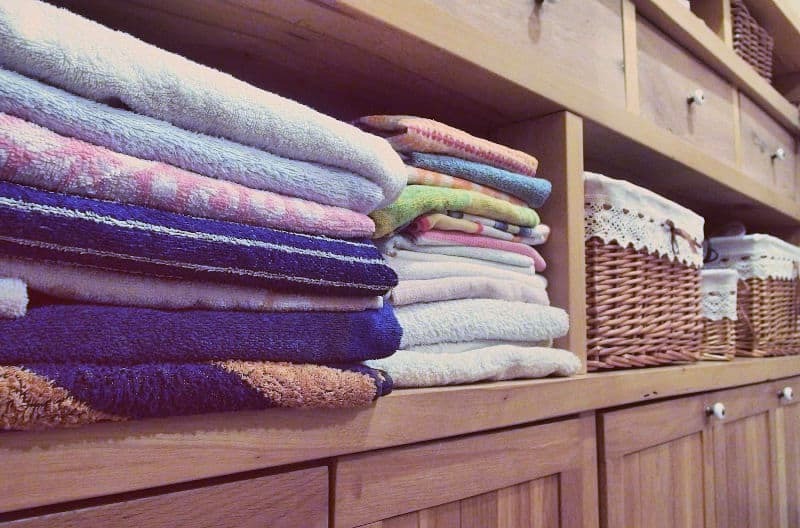 Fold clothes in the laundry room, and you’ll keep them from taking over your house. If you’re following Marie Kondo’s method, folding clothes is a must. Using an ironing board as a folding surface is an excellent use for the thing if, like me, you try to avoid ironing altogether. Short on space? 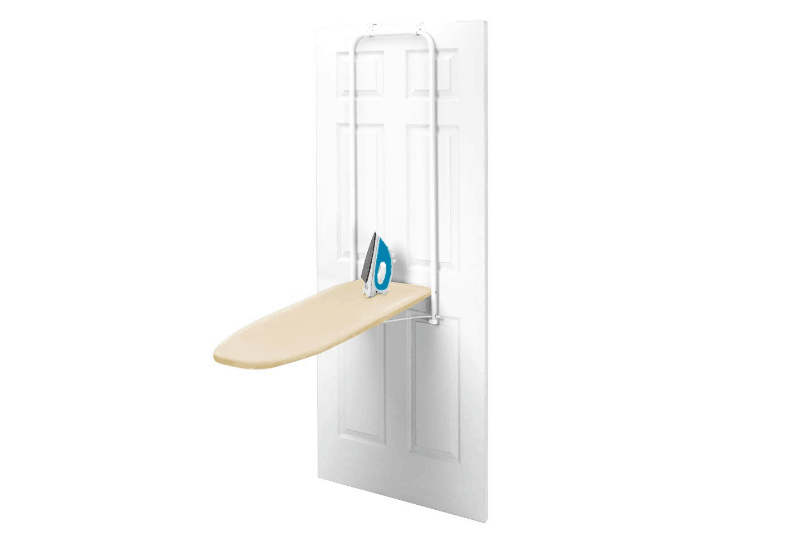 A door-mounted ironing board works great! Oh, and you’ll have room to iron, too. Use baskets and shelves to hold clothing-care items. Keeping a small sewing kit in the laundry room (with needles, several colors of thread, pins, and iron-on hemming tape) lets you quickly make small repairs. Having extra towels in the laundry room is also a good idea, in case the washing machine overflows. Pressing bulky items like sweaters and electric blankets between thick towels before adding them to the dryer also speeds up drying time. Be smart about transferring products to other containers. 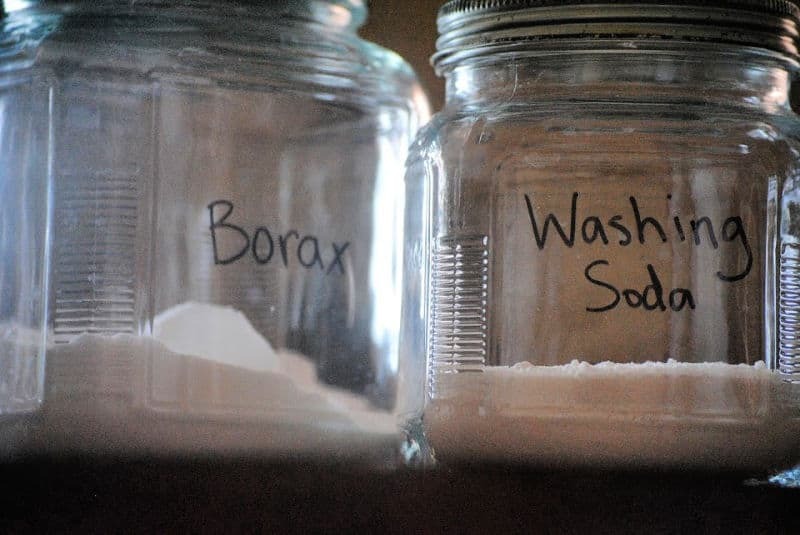 Moving Borax and washing soda to separate glass jars does help preserve them, since their boxes absorb moisture that makes the contents clump. Keep laundry pods in childproof containers! We’ve all heard about tragedies when children mistake laundry pods for candy. If you have small children, don’t put appearance over safety: leave the pods in their childproof containers! Also, don’t casually mix different products. Some common household ingredients become lethal when combined. 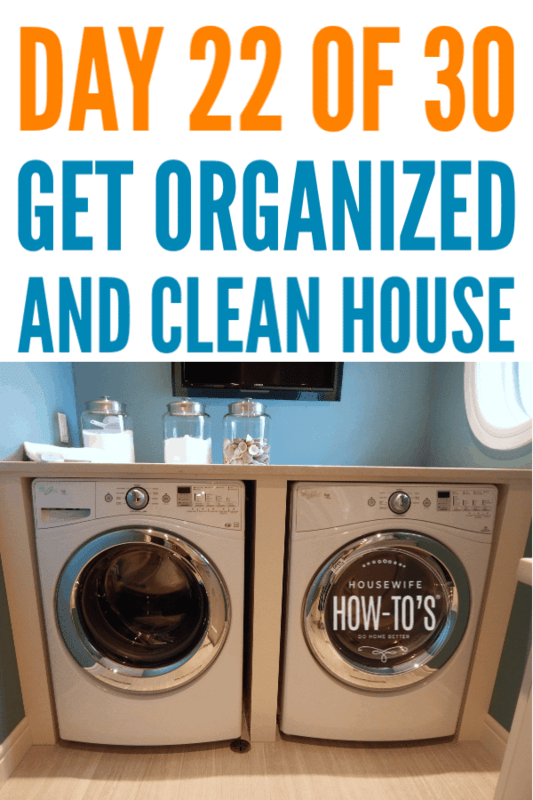 Cleaning the laundry room is much easier once it’s been decluttered and organized. Since a lot of lint and moisture flies around in this room, it’s a good idea to clean your laundry room at least every two weeks. Once a season, you should also deep clean your washing machine and also your dryer. Dust the ceiling, light fixtures, walls, window sills, shelves and doors. Wipe the shelves with a damp microfiber cloth — including everything you’ve shelved. Use a clean, damp cloth to wipe the appliances inside and out. Clean the window and polish any glass. Keeping the areas we’ve previously ROCKed from getting overrun with clutter is part of the daily cleaning routine we’re now following. If you haven’t yet printed that checklist up, take a moment to do so. Entryway and coat closet: Everything hung up? Toss trash, and grab things that don’t belong and put them away. Dining table and kitchen: Put things away. Wipe horizontal surfaces. Bathrooms: Check supplies. Use a disinfecting wipe on faucets, sink basins, toilet seat and rim. Empty trash. Closets: Everything hung up? Grab things that don’t belong and put them away. Bedrooms: Make beds, put away clothes, toss trash. Grab anything that doesn’t belong and put it away. Home office: File or shred papers as needed. Empty trash. We’re getting down to our final week of organizing and cleaning our homes. The good news is that the next few days are much easier! So, catch up if you need to, and don’t forget you’re invited to join our Do Home Better Group on Facebook to show off your progress!